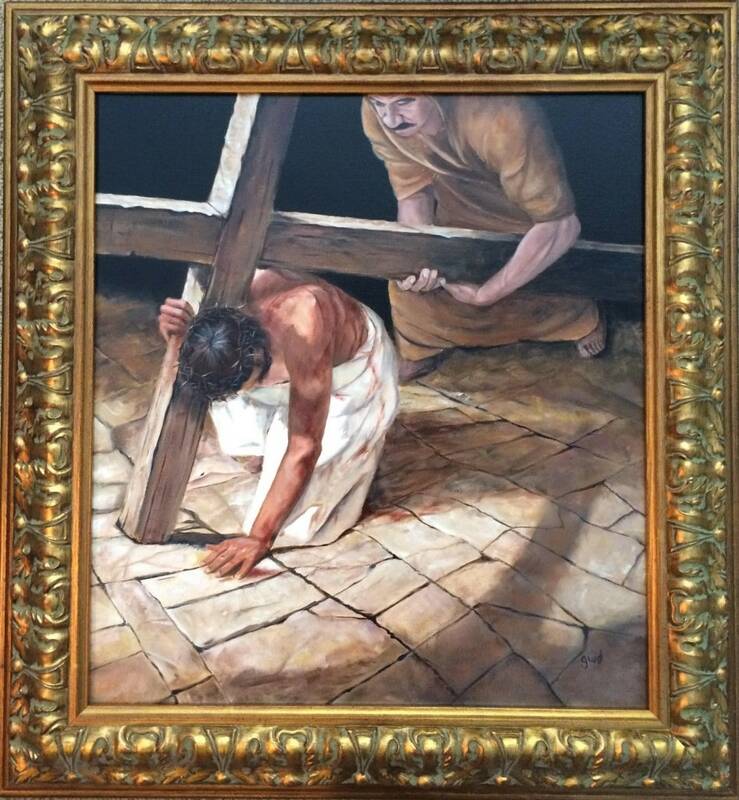 After signing up to help create a piece of art for our Lenten observation of the Stations of the Cross, I first read what I could find about the station I chose: the fifth station, in which Simon of Cyrene (Libya) helps Jesus carry the cross. Wanting inspiration and direction, I searched high and low for nuance and/or some subtle aspect of this scripture that I could build upon. Then, the epiphany (for me at least). It was right in front of me. Simon, a common man – snatched from the crowd – was given an unimaginable opportunity: to give direct assistance to the Son of God. How could I not be inspired by this incredible opportunity afforded Simon? Would not each of us love to be given that chance of a lifetime? Well… for now. I can paint! I wish to express my sincere thanks for the opportunity to be part of celebrating the Stations of the Cross. I particularly wish to thank Bill Dauphinais for including me in such great artwork. I was very much inspired by his words when he remarked, “Of all the millions and billions of people, Simon (of Cyrene) was chosen to help Jesus with the cross.” Rolling forward to the present time: I am now selected for such an opportunity. My own thoughts are: we never know what our purpose in life might be at any given time, but when the light of Christ shines through, it allows us great opportunity to reflect his light of love, his forgiveness, and the small parts that we can play in his redemption plan. It’s my prayer that many will be inspired not only to take up our cross and follow Christ but to be willing to help others with their crosses as well. Click here to learn more about our Lent 2016 offering, the Artist’s Way of the Cross.